Have you seen how I typed above two words? There is a reason why I typed those this way. I’ll explain it later in this post. In the meantime, let’s get some knowledge about masonry work. Have you remembered how I explained masonry work in our building construction tutorial series? “Mortar related work is masonry work”. What is mortar? Mortar is nothing but a mix of binding materials, fine aggregate and water. Read following posts. A few days before, I wrote a post about various types of mortar. Read it here. In this post we will see the types of mortar based on their compressive strength and where to use them. Here comes the reason I typed above two words. See those words. There are alternate capital letter in them, M, S, N, O, K. These are the types of mortar. Among them Type M mortar has highest compressive strength and Type K has the lowest compressive strength. It has the highest strength of all. That is 2500 psi. We use this type of mortar in exterior masonry work and the masonry member which is built at ground or below ground level. This type of members are load bearing wall, footing, retaining wall, driveway etc. This type of mortar also has high compressive strength. It also has high bondability. 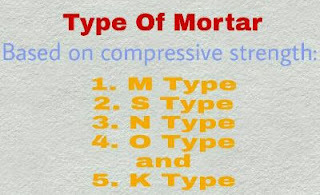 The strength of type S mortar is 1800 psi. It is used in the structures which require resistance to significant lateral loads from soil pressure or earthquakes. This type of mortar has excellent durability to use in structures at or below ground and in contact with the soil, such as retaining wall, footing and pavement. type N mortar is the most used mortar and number one choice for mason. This general purpose mortar is suitable for above-ground masonry work. It is recommended for exterior masonry veneer and for interior or exterior load bearing wall. The strength of this type of mortar is 750 psi. This mortar has comparatively low compressive strength. It should be used in interior masonry and not recommended to use in exterior masonry. Above ground and non-load bearing structure are suitable for this type of mortar. The compressive strength of this type is 350 psi. It has the lowest compressive strength of all and it is rarely used but sometimes used in ancient building for repairing work. compressive strength of this type if mortar is 75 psi.